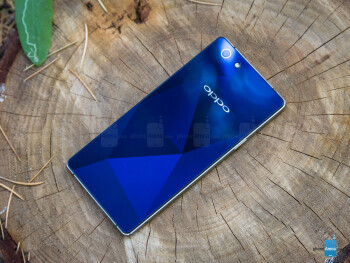 Back in January of 2015, Oppo unveiled the R1C – an upper mid-range handset released just before the Chinese New Year celebrations. Now that the shopping flurry in its homeland is over, Oppo is preparing to make the smartphone available internationally, launching it under the name Oppo R1x – same hardware, different letter at the end of its name. So, where is the Oppo R1x supposed to stand in the smartphone jungle? Its specs are reminiscent of the super-slim Oppo R5, save for the slightly smaller, 5” display with a lower resolution of 720 x 1280 pixels. The R1x has an 8-core, 64-bit Snapdragon 615 humming under its hood, coupled with 2 GB of RAM, and a potent-on-paper camera combo – a 13 MP snapper on the back and a 5 MP one on the front. 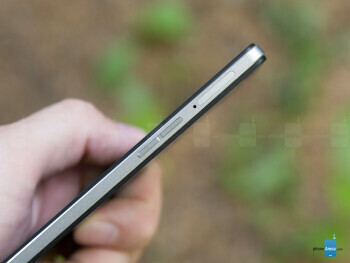 But unlike the R5, the Oppo R1x does not aim for the “Thinnest smartphone in the world” crown. While still extraordinarily thin, the R1x packs a 3.5 mm headphone jack, a dedicated speaker, a microSD card slot, and a battery of a decent size – all essentials the Oppo R5 lacked. Overall, the R1x sounds like a solid mid-ranger all around, so let's take a closer look and see how it holds! A stark but elegant rectangular shape is what immediately greets us as we unpack the Oppo R1x. An aluminum-magnesium alloy frame with chamfered edges wraps around the phone's sides, giving it a modern look and feel. The volume control buttons can be found on the right side, while the power toggle is on the left, all situated on the metal frame and made of the same material. Unfortunately, the buttons themselves are shallow and wobbly, not offering a satisfying click when operated, but still work. Also, the capacitive buttons on the front lack any sort of backlight, which may look stylishly subtle, but makes them nigh invisible in darker environments, especially on the black unit that we have. The Oppo R1x feels grippy when held, it's light and easily operated with one hand, and carrying it around in a pocket presents no issues or uncomfortable jabs. Its back panel has a glossy, glass-like look to it, and has been specially treated so that it reflects light in a diamond-like pattern. The shapes are far less visible than what the stock photos make them out to be, and are a bit understated, which can be a good thing, as the back is not annoyingly flashy. On the flip side, don't expect to be showing off with the unique effect, as trying to demonstrate the reflections to an observer can be hard under unfavorable conditions. 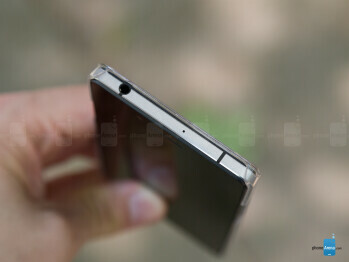 Additionally, fingerprint smudges are very visible on the back of the black unit we have. The handset is also available in white and we'd imagine that smudges will be a bit less visible with that color variant. The Oppo R1x rocks a 5” display with a resolution of 720 x 1280 pixels, resulting in a pixel density of 294 PPI. Some may frown at these numbers, seeing as, nowadays, it is believed that a minimum pixel density of more than 326 PPI is required if the display is to show no pixelation. But in the case of the R1x, we found the picture quality to be perfectly acceptable for normal use. Naturally, if one is used to QHD (1440 x 2560 pixels) screens, they will probably perceive a slight loss of detail. Colors on the Oppo R1x's screen look satisfactory and fairly accurate, with only the blues and greens showing a very slight oversaturation at certain moments. Color temperature measures at 6,838K, which is not far off from the optimal 6,500K, leaving the screen looking just a bit cold, but not annoyingly so. The display's gamma is slightly uneven, measuring at different levels across the different points of the grayscale, but generally staying above the reference value of 2.2. As a result, the dark areas in images appear darker, while bright areas look as intended. 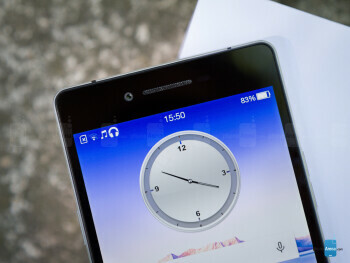 Brightness goes up to 474 nits, which makes the _phone_ usable outdoors, even on a sunny day. The lowest it can go is 5 nits, which is great for night-time readers, but not optimal, as prolonged sessions may become uncomfortable. All in all, the display on the Oppo R1x looks pretty good, with no major drawbacks. The Oppo R1x runs Color OS 2.0.1 – a home-made skin laid on top of Android 4.4 KitKat, which is a bit disappointing, seeing as Lollipop has been out for more than half a year now. The Color OS itself is quite away from the traditional Android looks and feel, as it comes with its own signature icons, apps, animations, and sans an app drawer – something we see often on phones meant mainly for the Asian markets. On the flip side, the UI delivers a number of cool functions, such as a meter that shows your current download and upload speeds, lots of useful toggles in the drop-down notifications drawer, gestures, which allow the user to quickly access the camera, adjust volume, or take a screenshot just by swiping their fingers across the display in a specific pattern, and a number of little things that show a certain attention for detail – for example, a missed call notification will actually tell you how long the caller was holding the line before hanging up. 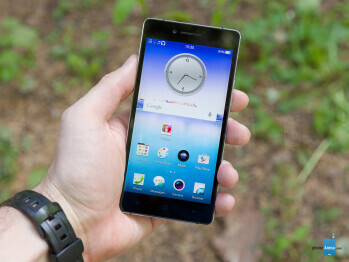 The Oppo theme store is pre-installed on the handset, giving you access to plenty of themes to pick from, and overlay “weather” effects are also present on the handset – you can have snowflakes, thunderstorms, fog, and other elements show up on-screen, either by choosing one of them, or letting them sync up to the weather forecast and rotate on their own. We have to say, some of the effects do look good, but we imagine this function would remain largely unused, as it might affect the device's performance and battery life. 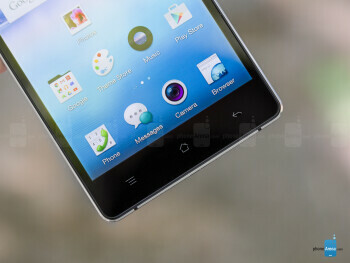 Oppo's signature music player and quick camera widgets are also making their return – these screen-wide controls place themselves on the farthest left of the home screens, should you choose to enable them from the settings, giving you quick access to music playback and photo snapping in their own stylish way. And finally, Color OS 2.0.1 is not a laggy interface, but we can't call it snappy either, as there is a faint sluggishness to be felt. Also, a bit annoying is the lag that occurs when opening the recent applications list. The 64-bit, octa-core Snapdragon 615 is a mid-range SoC, and we have to say we are quite satisfied with what we've seen from it so far. It delivers in gaming, browsing large webpages, and multi-tasking with ease. The way the chip handles in the Oppo R1x did not disappoint, maintaining a solid performance all around, with only minor hiccups at times, and the 2 GB of RAM allowed us to breeze through apps, as we normally would, without issues. The phone comes with 16 GB of internal storage, 11.5 of which are user-available. This may be a bit of a disappointment, but at least it allows for expansion via a microSD card of up to 128 GB. The Oppo R1x's screen makes for a pleasureful browsing experience. The 5” diagonal may be a bit small for prolonged web browsing, but in terms of sharpness, we had no issues reading fine print, unless, of course, it was just too small and required zooming. Oppo has included its own proprietary browser, and we have to say – we quite like it. Obviously, it has been “inspired” by Safari on iOS, as the layout and controls are very reminiscent of Apple's browser. The handset supports dual SIM dual standby operation, housing nano SIM and micro SIM slots in its tray. There is a catch, however – the micro SIM cutout doubles as a microSD card slot, so if the user chooses to expand their storage, they have to forgo the dual SIM setup for the time being, or vice-versa. The phone has all the contemporary must-have connectivity options – Bluetooth 4.0, Wi-Fi 802.11 b/g/n, USB 2.0, GPS and NFC. Also, FDD-LTE is supported on bands 1, 3, and 7. 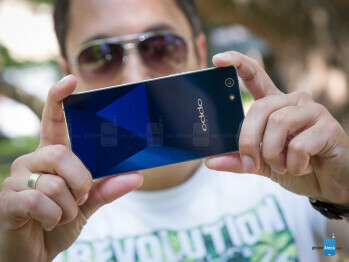 Oppo has outfitted the R1x's main camera with a 13-megapixel Sony Exmor RS IMX214 sensor. In general, we liked the imagery, though the lack of OIS meant that once lighting became less-than-favorable, we had to keep our hands exceptionally still in order to not blur the photos. Most photos look neutral in terms of white balance, objects in focus are sufficiently sharp, and digital noise is easily visible, yet within tolerable limits. On rare occasions, however, you might end up with a slightly blurry image – if your hands aren't steady enough, or if the camera fails to nail the focus at the right point. HDR mode is also available on the R1x, and we are happy to say it's much better than what we saw from Oppo the last time around. While it's not as effective as HDR on top-of-the-line smartphones, it will more often than not manage to even out the exposure between differently-lit elements within a shot. In some cases, HDR on the R1x will even manage to provide more accurate colors, though, to be fair, it also managed to throw colors off in a few shots. Oppo's proprietary Ultra HD mode is also available out of the box. This setting will stretch photos up to 25 MP resolution snaps, despite the camera having a 13 MP sensor. The effect varies – sometimes the pictures end up being slightly better, at other times – blurred up and unclear. The camera also has an Expert mode (a.k.a. manual mode), which gives the user control over shutter speed, focus, white balance, ISO, and exposure compensation. Other modes include Slow shutter, Panorama, Beautify, Colorful night, RAW, GIF maker, After focus (a.k.a. Selective focus), among others that you can download and arrange as you desire. Recorded videos end up being colorful, but not very detailed. Even normal movement tends to distort or tear up the objects, making them hard or just unpleasant to follow. The clips end up having a pretty high contrast, resulting in dark spots in the scene being completely blacked out, and light sources being blinding white. Audio is also not the best, as it lacks depth and is slightly muffled. In general, you will probably avoid relying on the R1x as a video recorder. The selfie snapper is a 5 MP one and we found that it does a good job at capturing face details. Switching to the frontal cam will automatically put the camera app in “Beautify” mode, giving you a choice of 8 filters to apply to your mug shot. The 720 x 1280-pixel resolution lends itself to a good viewing experience, providing a good amount of detail and sharpness on the 5” display. Watching a movie was slightly irking, as we were haunted by the feeling that we could never get the brightness set to perfect viewing conditions, and we assume this was due to the display's slight lack of reds and uneven gamma. That aside, when checking out pictures, viewing clips, or playing games, all looks good on the Oppo R1x. The speaker can't be relied on for proper audio reproduction. It has a pronounced hump in the mid frequencies and a definite lack of depth, so don't expect to be getting any pleasureful ear-filling sound effects, drums, or bass. Otherwise, it's loud enough and does its job right when it's time to deliver alerts and rings. When taking a call, the R1x provides loud audio, which doesn't get crippled by digitalization. However, much like the loudspeaker, the earpiece delivers sounds with pronounced mids, and it lacks highs, which results in a lack of clarity. All in all, the other side needs to be speaking loudly and clearly, and you need to be in a noise-free environment in order to be able to understand each and every word. The microphone delivers very similar results to the other end, however, it seems it has some more depth and definition, as the other party is able to understand us more easily. The R1x has a 2,420 mAh battery to keep the lights on, and we were impressed with its longevity. It lasted 7 hours and 55 minutes on our battery life test – quite an impressive result, as it is higher than what flagships like the Galaxy S6 and HTC One M9 achieved and almost as good as last year's Xperia Z2's result – a handset that is universally praised for its battery life. Taking the phone for a ride as a daily driver showed that it is more than capable of lasting us through the day and still have enough juice in reserve. According to the manufacturer, the phone should provide 8 hours of talk time or 10.4 days of stand-by time on a single charge. Oppo also added two tiers of power saving for those stressful times when you are low on battery and still far from a power outlet. The phone's wall charger looks like it's made for Oppo's VOOC quick-charge technology, but it is, in fact, a regular charger, which juices up the handset fully for a little more than 2 hours. 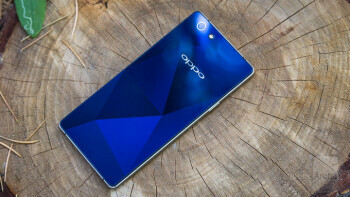 The Oppo R1x is a solid smartphone across the board – a good display, well-performing hardware, an adequate camera, and a battery that refuses to give up without a fight are among the positives of the whole package, while poor call quality and audio reproduction seem to be the only negative things that stick out. The phone's looks speak of understated elegance, and we like that. The wraparound frame gives us the look and feel of a metal construction and the device itself fits well in the hand and is easy to carry around. As a daily driver used for texting, web browsing, photographing interesting sights or social media snaps, the R1x is a suitable choice. Plus, the handset manages to maintain enough charge throughout the day, so that you don't have to feel paranoid over it dying on you. The phone doesn't do any one thing exceptionally well, but covers all the basics solidly, which is what we imagine a mid-ranger to be all about. 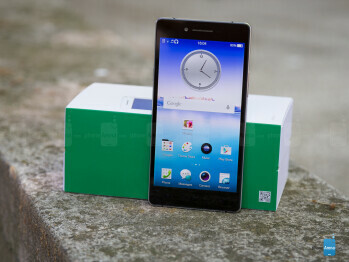 At the time of writing this review, Oppo have yet to announce an official price for the handset. Educated guesstimates point towards a price-tag of around $400 (off-contract), which, if true, we feel may be a bit too much for the R1x. Especially since the flagship-class Meizu MX4 and Xiaomi Mi 4, for example, can be bought from sites like Oppomart.com for $319 and $329, respectively. However, if the handset ends up costing around the $300 mark, we'd say it's worth a consideration.